She slept too long, again. The sun is out and she decides that she won't at least lose the rest of the afternoon. She has some chores to take care of - nothing challenging and for the first day in a long time, nothing that has anything to do with her dad's passing. After having done that she walks by the grocery store and in the plaza in front of the store, sees a miriad of friendly, small faces all looking towards the sun. She takes one of them with her. It is called Cosmea and needs water but not too much, and sunlight, but not too much. She believes she will be able to supply that. But first she must carefully bring Cosmea home. And that she does. She has only taken the first few steps when a woman stops her and says: "Excuse me but can I ask you where you got this beauty?" She tells her, and the woman answers: "This is a Cosmea!" "I know", she responds, and immediately the woman takes a step back and apologizes, "Of course you do" at the same time as she goes, "It's got this little sticker with its name," and laughs. And the two of them part laughing, turning around a few times and waving. Cosmea and she continue to the bus stop. When she notices the group of people waiting she suspects that the bus is late. She stands next to a young man and he confirms her suspicion, telling her that they have been waiting for almost half an hour. And then he says: "You look so nice and blooming!" She smiles at him and only seconds later, they are deep in conversation about flowers, busses, yoga, meditating and all that is important in life. Like laughing, for example. They laugh a lot and other people begin to take notice and smile at them. Some do not smile but look on in a way that makes her think of how bitter so many people are. How much damage they must have taken. Later on the bus she takes Cosmea on her lap and listens to a beautiful young man sitting across from her talking in a very intense way at the older woman next to her. She would love to ask what language they are speaking, in other words, where they are from, originally, where their home was, or is but then thinks twice because - can you do that without sounding racist? So she says nothing but just enjoys the beautiful man and the beautiful language. The bus is stopping for no reason the passengers can detect and so, the people on the bus within seconds turn into a group of people sharing something. Sighs and smiles and shrugs of shoulders are exchanged. Suddenly a woman across the aisle asks the beautiful young man what she herself didn't dare, and he is not offended at all. He and his mother are from Iran, from Tehran, to be exact, and she tells the mother that she has been to Iran some 40 years ago. Now she is the one who must explain, and there on the bus, another small group has formed, existing of benevolent people talking about travels as students, protesting against the Shah and how beautiful Iran is. 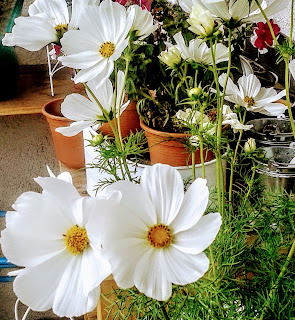 All the time, Cosmea nods and smiles with her many small white and yellow faces. When they finally arrive at her new home she first gets a fresh drink and then a cosy space next to her new friends, Geranium and Petunia.